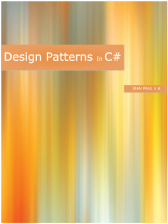 For students learning in the Microsoft environment, this book is a companion to the original Design Patterns text tailored to the C#. This book is an application book, rather than a theoretical one. It is written for students who want to gain a better understanding of the patterns described in the seminal design patterns book by Gamma et al. The book's intent is to give students the confidence and know-how to apply the original 23 patterns identified in the Gamma book, with all code examples provided in C#.